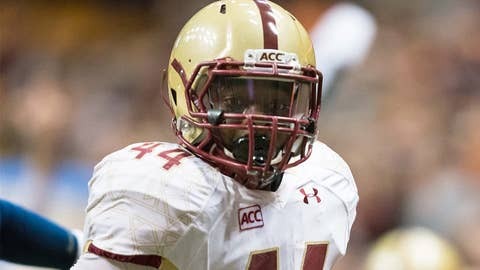 Andre Williams of Boston College is a Heisman Trophy finalist, and should he win, he says he knows exactly what he'll do with the award. Andre Williams says he has one group to thank for his Heisman candidacy — Boston College’s offensive line. Williams finished the season with 2,102 yards on 329 carries and 16 touchdowns, and vaulted into the Heisman conversation when he rushed for 1,130 of those yards over the course of five games. Credit for Williams’ success doesn’t lie squarely on his own shoulders, though, and the senior running back promised to share the spoils if he’s named college football’s most outstanding player. "If I actually win the Heisman, I will chop it up and give each of (my linemen) a piece of the trophy," Williams told USA Today. Williams said his initial goals for the season were to get BC into a bowl game for the first time since 2010 and to gain 1,000 rushing yards. He accomplished the second one pretty handily, and the Eagles will take on Arizona on New Year’s Eve in the AdvoCare V100 Bowl. The six Heisman Trophy finalists were announced Monday, and if Williams were to capture the award, he would be the first Boston College player to win since Doug Flutie in 1984.